The open, grassy plains of the eastern Free State boast a wide variety of plains game species. The fertile soils of South Africa's Free State province have ensured that much of this area is devoted to a thriving agricultural industry. However, these high-lying flat plains also provide the ideal conditions for a variety of plains game species, which has seen a rise in reserves, national parks and game concessions. Herds of springbok and black wildebeest particularly enjoy the wide, open areas, while kudu and red hartebeest frequent the koppies and ridges. 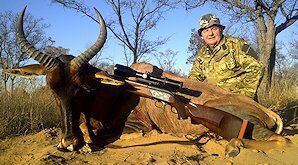 If hunting plains game does not get your heart racing, four of the Big Five (buffalo, elephant, lion and white rhino) are also available for hunting in the Free State. The camps we utilize in the Free State are located between three and a half and four and a half hours from OR Tambo International Airport in Johannesburg. If you have booked a package to the Free State and your flight arrives before 11:00 am, the hunting camp will be traveled to on the same day. If, however, the flight arrives, later a connecting night will be spent in Pretoria. 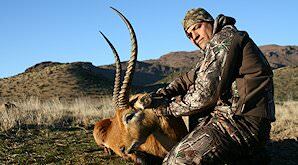 The Free State is the best of the South African hunting areas during the summer months (from October to the end of March). 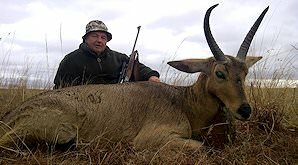 April and September, though slightly chilly, are also great months for a hunting safari in the Free State. June and July can be very cold, but if you are well prepared the experience should be rewarding. 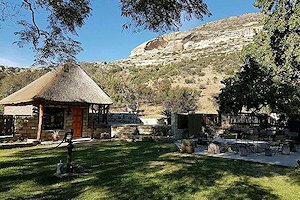 Horse trails, quad bike trails, fly fishing, game drives in the Golden Gate National Park as well as visiting a Basotho cultural village and the artistic town of Clarens are amongst the activities available to non-hunting members of the party. 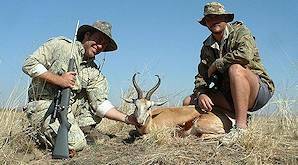 Activities that fall outside the normal hunting safari activities are charged at an additional rate that varies depending on the specific activity. 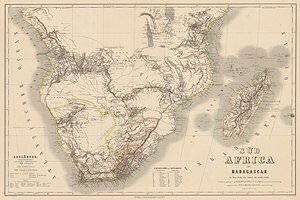 Vast grassland plains with scattered hills and distant mountains typify the terrain in this central part of South Africa. Black wildebeest may be smaller than their blue cousins, but they are far less common. 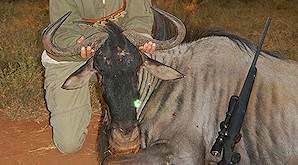 Equipped with excellent senses, black wildebeest may prove a more challenging hunt than expected. Blesbok are known for the white markings on their faces - a white mask that stretches up from the muzzle and a small patch just above the eyes. Blesbok are closely related to the bontebok antelope species. White blesbok only deviate from the common blesbok in their coloration. They are not albinos and owe their white pigmentation to a mutated gene. White blesbok will be found naturally among herds of common blesbok. Large populations of blue wildebeest can be found throughout Southern and East Africa. 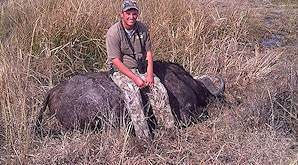 Male blue wildebeest reach an average of 150cm at shoulder height and 250kg in weight. Though both buffalo sexes carry horns, the horns of a buffalo bull are inarguably the most spectacular. Hunting this member of the Big Five can be extremely thrilling - and very dangerous! 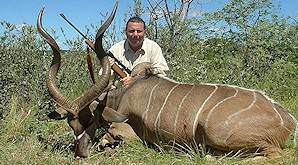 Eland are extraordinarily large antelope. 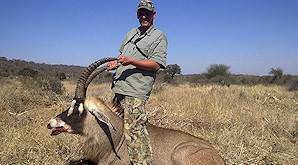 The common eland is second in size only to its northern cousin, the giant eland. 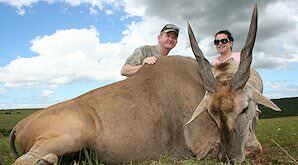 Eland bulls average a shoulder height of 1.7m and 700kg in weight. The world's tallest land mammal can also be hunted on safari in South Africa. Hunting giraffe is typically done by spot and stalk, but they also have a very distinctive spoor. 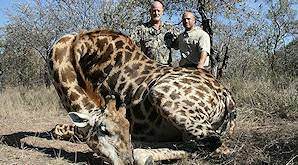 Though docile in nature, giraffe may become quite aggressive when threatened. Grey rhebuck are distinguished by their thick, woolly coat. 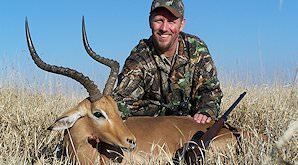 Early morning and late afternoon may be the best time to hunt these medium-sized antelope, as they tend to lay down in the heat of the afternoon. 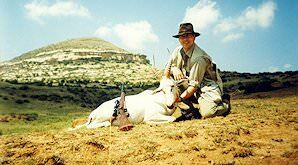 The magnificent gemsbok or giant oryx is one of the most spectacular antelope trophies that can be hunted in southern Africa. 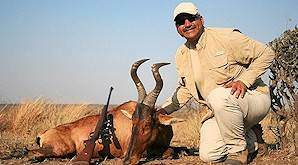 Its exceptional tall horns and beautiful painted face makes it a sought-after target. Impala are particularly easy to find, as they never stray far from water and occur in large herds throughout most of Southern Africa. 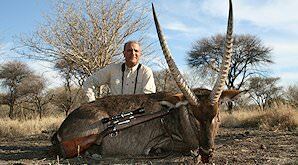 Most hunters will typically leave the continent having hunted an impala. While hunting a specific game species, hunters may often stumble across a black-backed jackal or side-striped jackal by chance. Many farms encourage jackal hunting to keep their numbers under control. 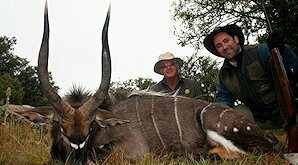 Kudu are among the most sought-after antelope to hunt on a safari in Southern Africa. Their spectacular spiral horns and beautiful features make for noteworthy trophies. 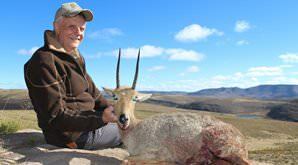 Lechwe can be hunted in the Free State and Eastern Cape in South Africa. They are typically found along floodplains, swamps and rivers. Expect to get your feet wet when hunting the red lechwe! 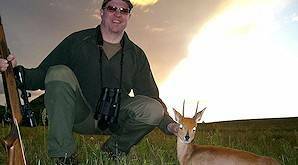 Though similar in size, the mountain reedbuck has slightly shorter horns than his southern counterpart. 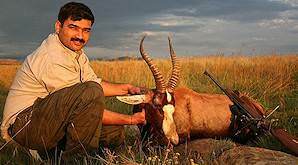 This medium-sized antelope may be difficult to approach on the mountainous slopes it calls home, which may thus call for a longer shot. Nyala form the dividing line between smaller plains game species referred to as rams and ewes and larger species distinguished as bulls and cows. While nyala males are called 'bulls', nyala females are 'ewes'. Red hartebeest are reputed to be the fastest antelope, often reaching speeds of up to 100km/h. Their unique horns have earned them the nickname 'the Harley Davidson' among hunters. 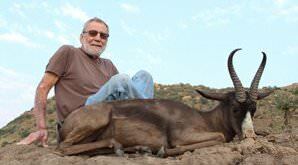 Roan antelope typically reach between 130 and 140cm at shoulder height and boast curved horns that sweep back. They are found in sub-tropical grasslands and shrublands. 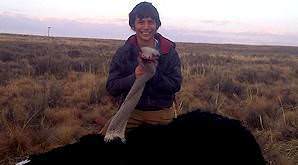 Ostrich can be hunted throughout most of South Africa. Male ostriches are preferred as trophies for their stark black feathers and marginally larger size. They are typically taller than 2m and weigh around 150kg. 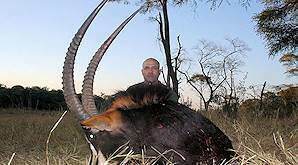 Though sable antelope are more indigenous to south eastern Africa, most hunting concessions throughout South Africa offer this intriguing plains game species for hunting safaris. 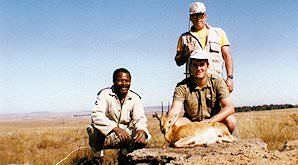 Hunting springbok is often complicated by the fact that both rams and ewes carry horns and reach the same height. They only differ marginally in weight, by 4 or 5kg. The hunter must thus have a keen eye when selecting his target. South Africa's national animal is considered the only true gazelle in South Africa. They are distinguished by their white bellies, white faces and dark side stripes. Springbok enjoy open grasslands. 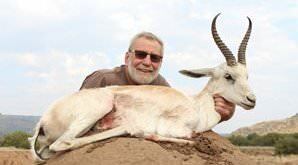 The stark white appearance of white springbok make them desirable trophies. 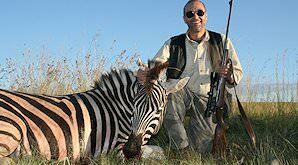 With only a few touches of darker hues, these gazelle bring to mind something pure and unattainable, which makes them all the more exciting to hunt. Like other small antelope, the refined senses of the steenbok may often make for a difficult stalk. 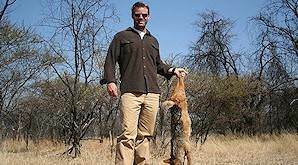 Nimble on their feet and slight in stature, steenbok will be able to escape quite efficiently when threatened. Unlike blesbok and bontebok, this peculiar-looking antelope is touched with a black blaze on its face rather than a white one. Dark brown in color, black patches may also appear on the lower half of the tsessebe's body. This relatively large antelope is distinguished by the circular white rings that appear on their backsides and their tendency to remain near water sources. Only male waterbuck carry horns, which tend to be quite impressive. Almost exclusively grazers, warthogs are not territorial and feast where they please. 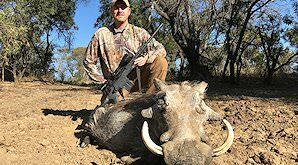 Warthog are prevalent throughout sub-Saharan Africa and, though they may prefer the bushveld of South Africa, they can be hunted in other provinces as well. Burchell's zebra are distinguished from other subspecies by their 'shadow' stripes, which appear as a faded brown on their white stripes. They generally reach 1.3m at shoulder height and weigh in at around 350kg.